This video cuts to the chase of why in the next 2 years we will go through a medical practice disruption. It goes into the actual practice needs vs HIT financial incentives that are part of the "meaningful use" clause, that everyone is executing against. 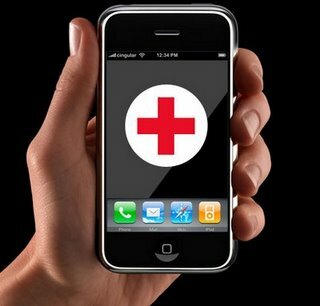 by 2013 all most all doctors in US will be using a new wave of web based, iPad/iPhone , and android apps every hour of the day. Watch this video from GE (this is marketing video for GE Centricity EMR) to see what this upgrade means to our healthcare system as a whole. This is a much needed update to our health infrastructure. 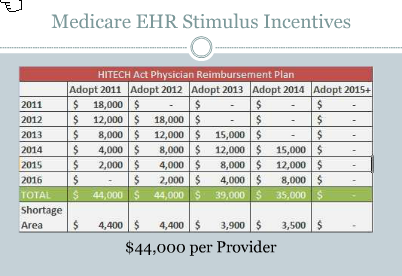 To delve just a little bit deeper into the financial incentives the federal government has created for practioners to adopt EMR's. See the screenshot below. Its pretty convincing that given a $44,000 pay out over 5 years plus with the benefits called out in GE's video above. Practices are actually going to upgrade and adopt emr !